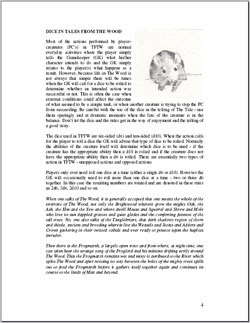 Tales From the Wood is a roleplaying game where you play animals from the British woodland: Mice, Rabbits, Vole, Squirrels and Hedgehogs. If you think that's a rather low calorie, limp topic for a hobby that is normally bemuscled men wielding swords, think again. Nature is cruel and this setting has the capability to be darker than the inside of Marylin Manson's underpants. Woodland animals too girly for you? As yourself what's more fae: A badger tearing the throat out of a weasel or an oily body builder prancing about in his underpants wielding his 'sword'? I do like to refer to the author of the games I review by their first name, it helps remind me that humans are involved. As there are two: Mark and Simon, I will refer to them as M&S, which fills me glee. You begin by picking your animal (race). Each creature has its own special features and these tend to be more varied than in stock fantasy. A character is described by Attributes, Lores and Abilities. The Attributes are Toughness, Sturdiness, Nimbleness, Craftiness, Viciousness, Alertness and Luckiness. Oddly, I resolved to never list attributes again while I was writing my last review but I decided to throw caution to the wind and tweak the nose of fate and do it anyway. After all, these are excellent examples of Attributes named well. Each race has a starting level and a maximum, so you don't get into the state of having super-strength shrews. You get 5 points to add onto your starting value and cost is the same as the level you're trying to get to. Abilities are innate physical modus operandi of each animal. Except fly and wisdom, any animal can do any of them. For example, Climb, Leap, Flee, Tooth and Claw (fighting) are common to all. Nominally, you get a d6 and if its listed against your race, you get a d10. Natural knowledge are dealt with by 'Lores', which are domain knowledge. Your characters live in The Wood, a charming British glade with ancient towering oaks, broad ferns, shining silver birches, fingers of sunlight poking through a canopy to a leaf strewn floor and all that stuff. You know, nature. I'm a software developer, so don't really have a concept of nature beyond it being outside and it encites people to get naked. Or is that naturism? The Wood is also a silent, living entity that exists in symbiotic harmony with the animals that live in it. TFTW describes it perfectly as "We need The Wood, The Wood needs us.". There is plenty of danger in the wood in the form of natural predators such as owls and foxes as well as the dark evil that is The Bane. The Bane is a sinister force that seeks to control and use the Wood for its own evil means. Boo! Hiss! The bane drives the the evil NPCs: Rats, Weasels, Crows and Adders. It's Animals of Fathing Wood or Watership Down but in game form. The system uses d6 and d10. If you have an ability (skill) in something, you use the d10. If you don't, you use the d6. Roll, add the appropriate Attribute and compare against a target. Simple, elegant. Fluffless, ironically. Opposed rolls are highest wins. Tooth an Claw is the skill the controls all forms of combat. It uses the same opposed rolls with damage being dealt as a simple equation using the Sturdiness of the character. Wounds are either Buffet, Scratch, Maim or Kill. Pretty brutal stuff. The GM is called the Gamekeeper (very appropriate) and has their own section that is equally useful for hard-nosed GMs with a thousand years experience and the new GM. Times of day, distances, language and their game affects are covered. The GM can make inter-character language as simple or as complex as desired (feel like a challenge? None of the characters can talk to each other). Guns, cars, poisons and the horror of woodland fires are all described and make for excellent adventure fodder. Everything described from the point of view of the animals, which makes it easier to fit into the game. The bestiary is small but there is more than enough to keep the players on their toes/claws/paws. There are also three example adventures (or tales). Each one is a good example of a how a linear adventure might be played out. If you're keen on buying an updated print version, there's one on Lulu. There are some niggles here. The layout is single column, which makes line length long. The pictures are lovely but too few. I worry that the paid version will be updated and improved but the free one will be left untended, which is a shame. There are some large empty spaces too. The biggest problem with Tales from the Wood is that it is a hard sell. If you have players like mine, and I pity you if they are, the very idea of playing woodland characters is the source of considerable derision. I mentioned Tales from the Wood some time ago and since then, they've be slavering, slobbering psychopaths - hell bent on the notion of putting a torch to the wood or causing a disasterous road traffic accident involving a chemical artic, a petroleum artic and a firewords lorry. They're plain evil. A substrate of filth growing on a postule on the rump of beelzebub. The Evil do not play woodland animals. Tales of the Wood is so charming, Stephen Fry could be caught speechless. The system is neat, the writing of a high standard and the pictures simply superb. Excellent research ensures the suspension of disbelief. Where Tales of the Wood excels is that it can be cute for the kiddies and sinister for adults. 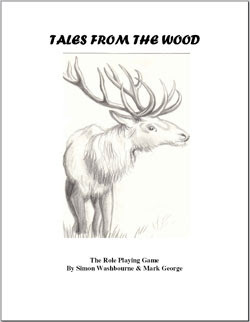 If your players can be convinced to throw themselves wholeheartedly into Tales of the Wood, I believe the experience will be both novel and delightful. This is no ordinary wood, this is M&S's Wood. Many thanks M&S. Great review! I'm a big fan of this game and have always wanted to run a campaign of it. It's weird this resistance against playing small woodland animals. Some of the most escapist fantasy novels of my childhood come from this genre. Olman, I'm thrilled that you can see it washing with your player group. 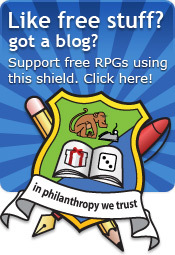 I do think it's a hard sell for many roleplay groups. It's a cracking game and a great idea. As adults you can play the game as dark and sinister as you want - there's a few parts of Watership Down that still makes my skin crawl, especially the old General rabbit. It'd be hard to convince a hack n' slash group to play it but I think it'd be more than worth the effort. Watership down always scared the bejesus out of me when I was knee high. On one hand, it was a well drawn cartoon about rabbits and on the other, it was a harrowing bunny nightmare of truly epic proportions! Looking back, I was right to fear it. I think the majority of gamers would find this a hard sell but I do agree that a taste of something different is good for the soul. What a great looking game! I love the concept, and I can't wait to give this a read-through. There's not much space in my group's calendar, but I'd really like to fit it in somewhere. It's an excellent game as it stands - any idea how the new (not free) version fares? @Aggro, glad you like it! Would you be the Aggroboy I've collided with once too often? @Hogscape, I haven't seen too much of the pay version. The few pages I saw on the preview were better laid out with more graphics, so I have high hopes for it. Frankly, given the strength of the free version, I think it's worth splashing out on the full one. @Rob One and the same. The pay versions is excellent with easier to follow layout, better and more clearly designed charts and tables. Simon is also a wonderful person to coorespond with and has eagerly shared his thoughts on the game when I first started up. I play this game with adults and my children and we all have a great time. 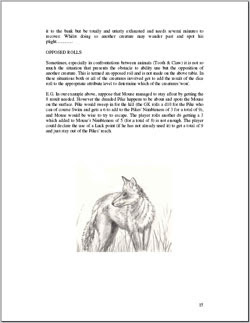 As a GM, it's really fun and challenging writing adventures for non-anthro animals. Eli, thanks for your buyers perspective. It's really useful to have on the end of the review. I must admit that when my as-yet-to-arrive son is old enough to play, Tales from the Wood is something he and his mum will enjoy. Watership down always scared the bejesus out of me when I was knee high.